Email exists in our list. Please use other email. Despite the shortage of photo essays about current events, photojournalism in October records excellent series about daily life. The stories about ordinary individuals bring readers a refreshing outlook on life with more joy and sympathy. 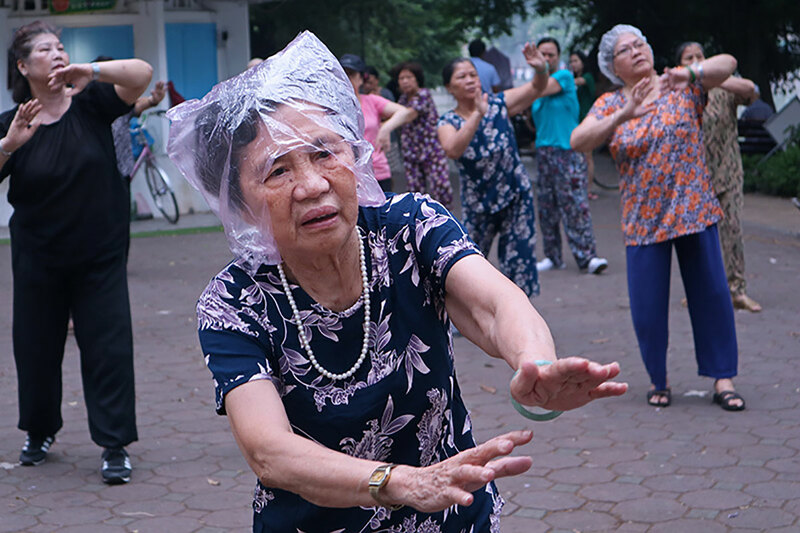 Through the witty lens of photojournalist Le Anh Dung, the life in the early morning of Hanoi residents appears both whimsical and casual. The author captures funny and lovely moments of the elder working out, gossiping, reading news, drinking tea, etc… and attaches simple captions. In the midst of the rushing urban life, Hanoi at dawn remains homey and peaceful as ever. While Hanoi is entering the loveliest month of the year, Saigon is facing flooding season in October due to tidal peaks. The series by photojournalist Huu Khoa help readers get a glimpse of a city soaked in water as the tide rises. 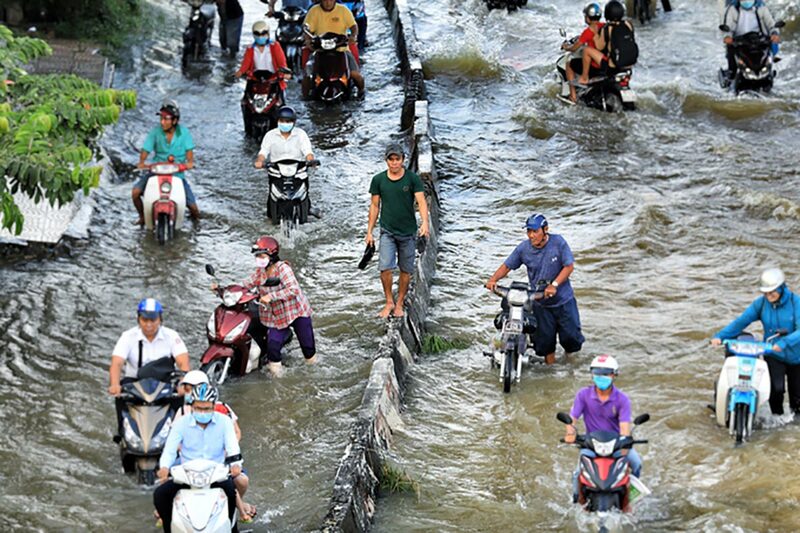 Some exceptional moments emerge, including one where a man walks on the traffic barrier to avoid the flood while motorbikers struggle with rising water. Reporter Hoang Viet tells an original and intriguing story about a farmer starting up. Tran Minh Tien used to be a home economics teacher before he quitted the job and returned to his hometown in Long An. 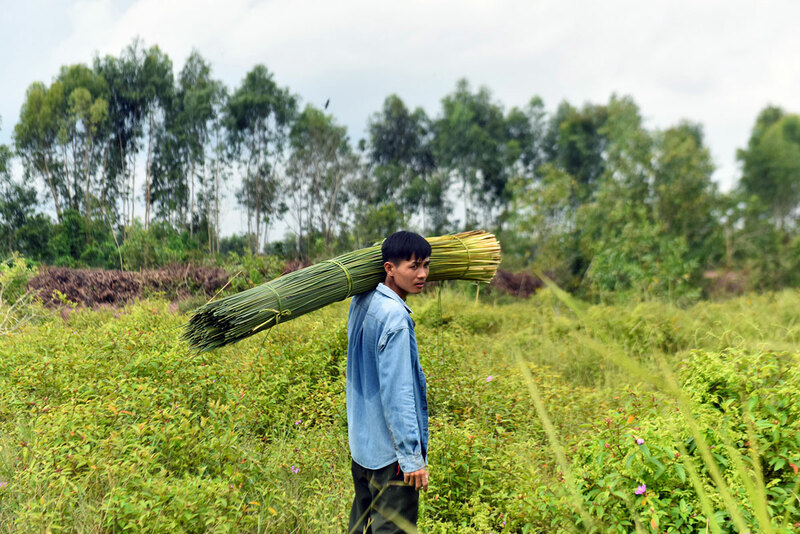 Here, he now makes straws from bamboos and wild grey sedge plants and distributes them to restaurants and cafes all over the country. The nickname “crazy” Tien given by his neighbors originates from such a strange decision. Through the lens of photojournalist Hoang Viet, the portrait of the young farmer and the manual straw-making process appears vivid and lively. Despite a good plot and nice photos, the report could be shortened for the sake of concision. The photo essay by journalists Pham Thang and Ha Quyen strikingly depicts “the anxiety and the fear” of psoriasis through the stories of the patients at the National Hospital of Dermatology and Venereology. The authors manage to closely approach the patients with consideration and choose to capture the issue in an honest rather than shocking manner. so as to avoid pushing the readers further away from the subjects. I personally expect a clearer structure of the series, specifically in terms of the roles of patients, relatives, and physicians, as well as an open conclusion to make the story more complete. The documentary Finding Phong was the spotlight of cinemas all over the country last month. Following the main character Le Anh Phong, photojournalists Viet Linh and Quang Duc capture a day in her life at home and at work. The series gives a new outlook on transgender whose images are often tied with performing on stage: Phong works as a muppet painter and a receptionist at Thang Long Water Puppet Theatre. She is portrayed through a tactful lens without any intention of romanticization and dramatization, and thus appear both special and ordinary. Thanh Nguyen is a photojournalist for VnExpress. He cares about social, cultural and humanitarian topics. Before starting to work in Saigon from 2016, Thanh was based for 6 years in Central Highlands and South Central Coast of Vietnam. “In Focus” is a series that highlights outstanding photo essays in the past month so our readers can keep up with the news and learn about building a visual story. This is also to express our gratitude to professionals working around the clock to keep the flame of photojournalism alive. Outstanding photo essays in October 2018.